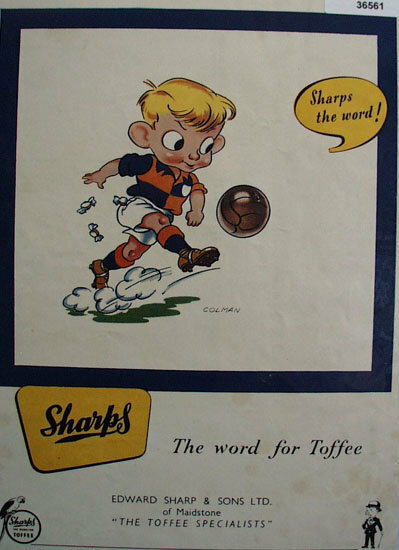 Sharps Toffee 1952 Ad. This color October 15, 1952 ad by Edward Sharp and Sons of Maidstone states the Toffee Specialists. Sharps the word. Cartoon picture by Colman shows boy kicking soccer ball. He has Sharps Toffee candy falling out of his pocket. Magazine tear sheet picture is taken through plastic and may show wrinkles or crookedness that is not in the ad. This Original magazine tear sheet measures 8 1/4 inches wide by 11 inches tall. Items Similar To "Sharps Toffee 1952 Ad"